Earlier this year, HTC had promised to update its HTC 10, HTC One A9, and HTC One M9 devices to Android Nougat. Now, with Google released the final build of Android 7.0 Nougat this week, HTC has offered some of the details on timing for the roll out on each device. 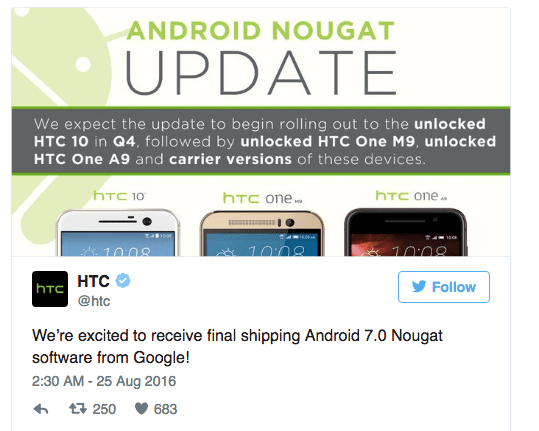 According to a tweet, HTC said that HTC 10 will be the first device to receive Android 7.0 Nougat sometime in Q4 2016. After HTC 10, HTC One M9 will receive the update alongside HTC One A9. This timeline is a delayed one when compared to the earlier promise the company made. During the launch of One A9, it mentioned that unlocked version of the smartphone will get Android Nougat 7.0 within 15 days of when it first gets pushed to Google’s Nexus devices. Meanwhile, Google has confirmed that the new smartphone to ship with Android Nougat will be the LG V20. The smartphone is scheduled to get launched on September 6 in San Francisco. The update has begun rolling out to Nexus devices and Pixel C users earlier this week. Sony has also announced the plans to update a few of its devices to Android Nougat 7.0. The list of devices includes Xperia Z3+, Xperia Z4 Tablet, Xperia Z5, Xperia Z5 Compact, Xperia Z5 Premium, Xperia X, Xperia XA, Xperia XA Ultra, Xperia X Performance. The company has omitted Xperia Z2 range from the list, so it is not clear if these devices will get the updates. Sony Mobile did not reveal the exact timeframe for the roll out for these devices.